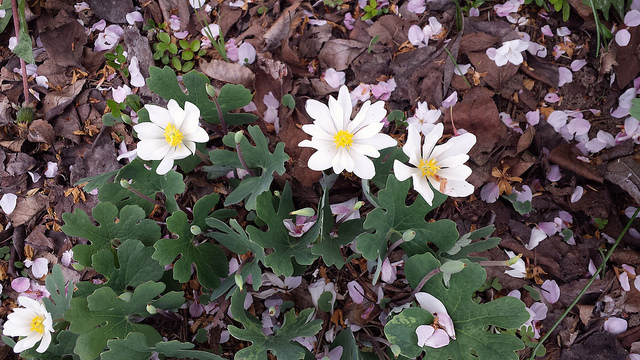 Bloodroots are nearing the end of their blooming season. This is one that started with one clump of roots ages ago that I’ve divided and moved around. It multiplies beautifully and provides flowers at a time when little else blooms. They will grow in shade or sun. 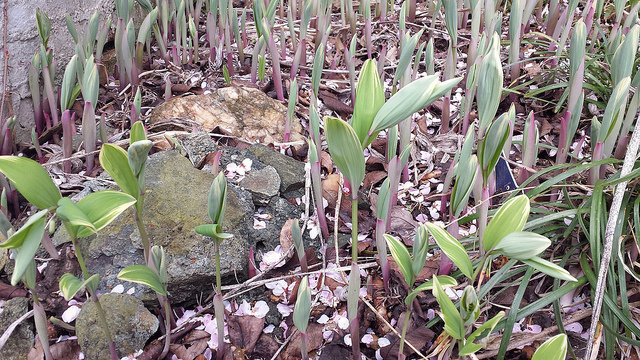 This variegated solomon’s seal is perfect for this soggy spot where rainwater runs out of the gutter. 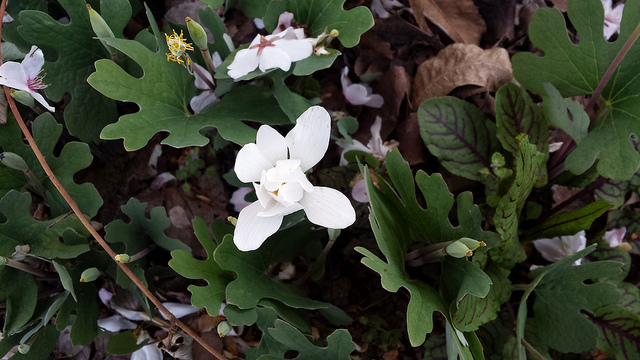 A purchase of three plants about ten years ago now fills in an otherwise difficult shady wet spot in my front yard. The flower spikes and foliage is gorgeous. It is just now emerging from winter’s sleep. 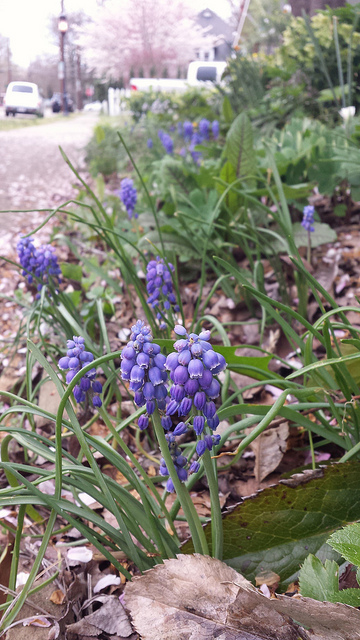 Another successful planting from three perennial bulbs of grape hyacinth that I bought around ten years ago. It was getting stepped on and so I dug up the three clumps, divided the bulbs, and replanted along the sidewalk. I’ve never been able to get a 100% positive ID on this flower, but you see it naturalized in many of the older yards around here, and it is my favorite sign of spring. I think that it is in the scilla family. One “natural” gardening website actually suggested eradicating it and said that she sprayed it with Roundup to no avail. Good for you, little squills. You show ’em who’s boss. (And NEVER EVER use Roundup, and don’t use the word “natural” if you do.) 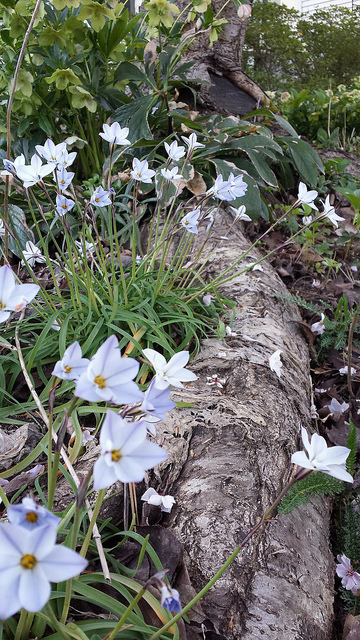 UPDATE: Identification made by Nancy in the comments: Ipheion uniflorum, AKA Spring starflower. Thank you!!! All these are in the front garden that I’ve been developing over the past decade. Hellebores, hostas, foxgloves, and comfrey take up most of the rest of it. that last flower – ipheion? Yes, that’s it! THANK YOU!